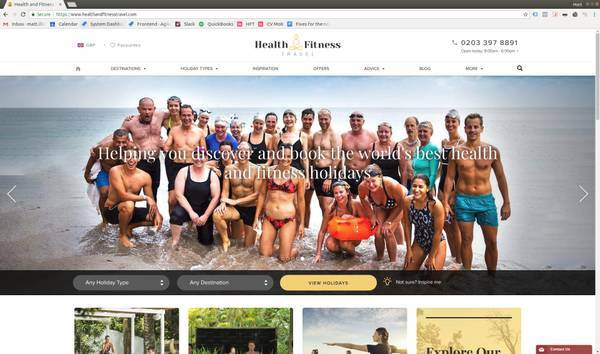 The challenge: Health and Fitness Travel exist in a very competitive space, so needed to be able to stand out from the crowd in terms of design, but also be very well optimised for SEO. The content that they had built up on their old website was huge, thousands of blog posts, specialist articles, landing pages and thousands of products and options. The biggest challenge was to get all of this content moved over to a new site, whilst trying to build it at the same time. Another issue is the sheer complexity of the product, which has many different levels of information. We fitted most of this into our TravelZen system without any problems, but did end up having to write a completely new, bespoke search engine to handle the way H&FT wanted it to be. The next challenge was to launch the site with a host of differences to the Australian market, whilst keeping both sites on one system! We're extremely proud of this website - it was far more complex than it first appeared, however we managed to deliver something that matched the comprehensive brief and which will be a platform for them into the future.